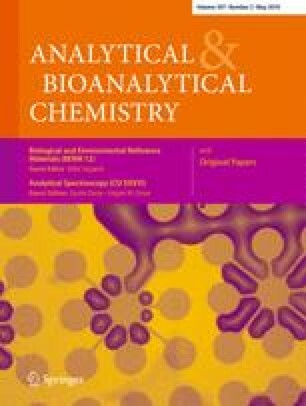 This study describes a modification to tricine sodium dodecyl sulphate polyacrylamide gel electrophoresis to make it more effective for the separation of low molecular mass proteins and for coupling with inductively coupled plasma mass spectrometry (ICP-MS). The modified method employs low-percentage polyacrylamide gels (7–10%) (w/v) and low reagent concentrations that provide efficient separations, good quantitation and low matrix levels that are compatible with ICP-MS. Using phosphopeptides as a model system, and offline analysis, we obtained recoveries of 73% (w/v) in a 9% gel compared with 55% in a conventional 16% gel. Online coupling was achieved by modification of a standard commercially available gel electroelution apparatus and casting of the gel into a 7.3-cm-long tube. Online separation of a digest of β-casein was demonstrated with recovery of the mono- and tetraphosphopeptides, which were identified by comparison with peptide standards. A mass balance study with the standards yielded recoveries of 95% for tetraphosphopeptides and 48% for monophosphopeptides. The factors affecting the separations and recoveries are discussed in detail. The detection limits for 10-µL samples of the mono- and tetraphosphopeptides were 0.7 µM (7 pmol) and 0.2 µM (2 pmol) respectively.